Since WEIN & CO was founded in 1993, the world of wine in Austria has changed substantially. The hybrid wine company offers an international top range of wine specialities in its online shop and 20 shops in Austria - seven of which have a bar. Gastronomes and private individuals have the opportunity to receive tailor-made advice and try out the particular products on site. All About Cards has continued this B2C (Business-to-Consumer) concept in the form of an attractive voucher card project for WEIN & CO. The high-quality gift cards with double stamped inlay were produced in two packaging options - as card carrier and folding card version. The gift card convinces by its simple and classic design as well as its matt lamination. 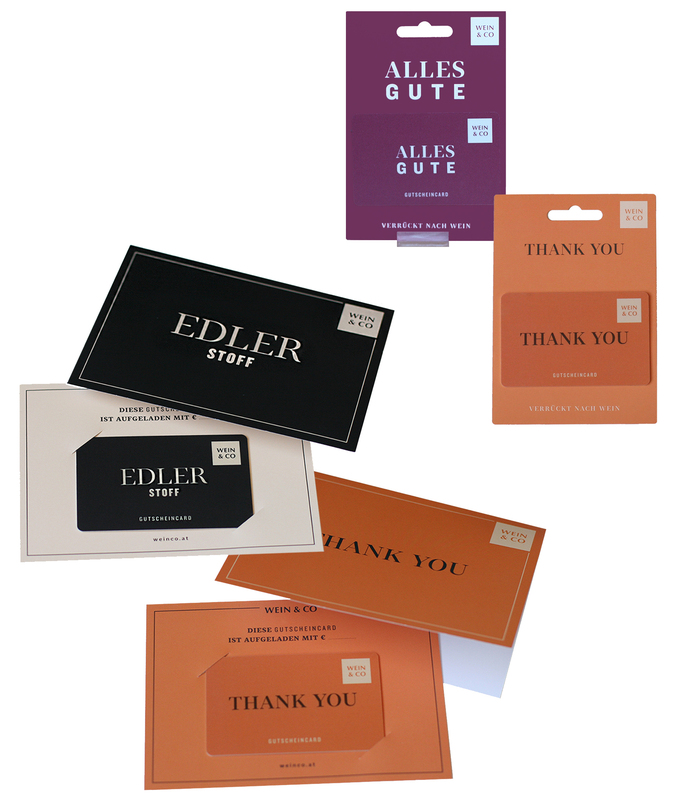 The colour variants of the cards, card carriers and folding cards range from muted turquoise blue to strong orange to noble black and the characteristic wine red of WINE & CO.
Due to the different lettering types, the gift cards are ideal for every occasion, as birthday or Christmas present as well as a small gift. The rear sides of the cards are multiple personalized: With a barcode and PIN with scratch field, the customer can redeem the unloaded card at any WEIN & CO bar or online. It is also possible to check your voucher value online at any time by entering the voucher number and PIN code. In addition to the gift cards, All About Cards realized the project relating to the loyalty programme of the WEIN & CO customer card named “VinoCard". More than half a million customers already use the customer card and collect valuable bonus points with every purchase. Upon request, the “VinoCard” is even an exclusive credit card from Diners Club, which in turn corresponds to the “Wining & Dining" concept. For that, All About Cards prepared simple customer cards in the recognition colour “wine-red" with pantone ink and produced the Diners Club forms. The WEIN & CO - project around the customer card, the gift cards as well as the packaging possibilities is a beautiful example for an elegant, simple design and illustrate a wonderful possibility of customer loyalty. “Highest quality and versatility is the credo at WEIN&CO. These demands are not only made on us by our customers, but also on our partners. All About Cards fulfils these expectations by providing equal advice and consistently high-value order fulfillment"
All About Cards is grateful for the uncomplicated and professional cooperation with WEIN & CO and is already looking forward to further projects! Are you also interested in customer, gift or voucher cards or attractive card packaging? Contact us and we are pleased to make you an individual offer. All About Cards - Competence around the card!